In June 1942 the Empire of Japan had become the dominant power in Asia and ruled a sizable empire. It acquired Formosa (Taiwan) in 1895, Korea in 1905, and Manchuria (renamed Manchukuo) in 1931. It invaded China in 1937 seizing control of key cities such as Shanghai, Nanking and Peking (Beijing). French Indochina (Cambodia, Laos, Thailand) were invaded after the fall of France in 1940 to prevent it from being used by the Chinese to funnel arms. A treaty with German backed Vichy France made French Indochina neutral but within the Japanese sphere of power. British Hong Kong fell to the Japanese after 18 days of heavy fighting on Christmas Day in 1941. Fortress Singapore, so-called because it seemed impregnable to attack, would fall to the Japanese on 15 Feb 1942. The Japanese avoided a frontal assault by coming through the less protected jungle at its rear. The Dutch East Indies (Indonesia) was conquered by March 1942 and The Philippines would fall in May. Burma would also be taken over as well. To protect their position in Dutch West Indies they began attacking northern Australia to prevent it from being used as a staging area. With the old imperial powers gone and Japan firmly in charge, nothing seemed to be in the way of Japan. The Battle of Midway changed that. Although the attack on Pearl Harbor on 7 Dec 1941 was considered a success in Japan, the United States was still in the game. The unexpected bombing of Tokyo on 18 April 1942(The Doolittle Raid) and its ability to fight as shown at the Battle of the Coral Sea (4-8 May 1942) convinced Japanese leaders they needed to so demolish American morale they would not want to fight any further. 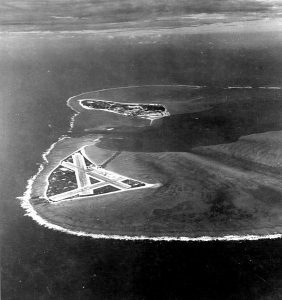 They choose a small virtually unknown atoll in the middle of the Pacific Ocean called Midway to draw out the American fleet to be destroyed. Midway is aptly named and 1300 miles northwest of Pearl Harbor and nearly halfway between Japan and the West Coast of the United States. Its strategic importance meant it was valuable for both sides. A military base was already there and seizing it from the United States would draw out their remaining carriers along with support craft to be destroyed. The plan was to send four carriers and support craft for the initial attack. Then a larger task force comprised of destroyers, support craft and troops commanded by Admiral Yamamoto would follow up to destroy the American ships than came to liberate Midway. A feint of attacking American outposts in the Aleutian Islands was used to distract the U.S. while it attacked Midway. The Japanese, however, did not know that its code had been broken. 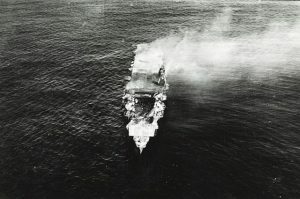 A special naval intelligence unit called HYPO had broken it in March resulting in much of the plan becoming known to the U.S. A task force was assembled of three carriers (Enterprise, Hornet, and Yorktown) seven heavy cruisers, 1 light cruiser, 15 destroyers, and 16 submarines would go out to meet the Japanese fleet. The Yorktown, already in badly need of repair, was patched up and its depleted aircraft and pilots scrounged up from whatever was available. In overall command was to have been Vice Admiral William Halsey but fell sick prior to the mission. Rear Admiral Raymond Spruance, who headed up the escorts under Halsey, would command Enterprise and Hornet. Rear Admiral Frank Fletcher was in command of Yorktown. On 4 June 1942, Admiral Nagumo aboard the carrier Akagi launched the initial air attack on Midway comprised of dive and torpedo bombers escorted by Zeroes. PBY’s launched that morning from Midway would sight two Japanese carriers and radar picked up incoming Japanese fighters. Midway sent up unescorted bombers to delay the attack while the fighters remained behind to defend Midway. Midway came under heavy attack and its air interceptors took a heavy beating fighting the Japanese. Anti-aircraft fire from ground personnel proved to be more precise. Midway took a beating but was still functional and could launch planes. Meanwhile scouting reports flying ahead of the American carriers placed the Japanese carriers at the extreme range for air attack. Making matters more difficult was the fact that Japanese scout planes had sighted the American fleet. Despite the extreme range, Spruance ordered the planes to be launched and increased the speed of the task force to close the distance. The torpedo squadrons left first but due to mechanical problems in launching the dive-bombers, had to fly unescorted. They would reach the Japanese and be quickly shot out of the sky by Japanese Zeroes and anti-aircraft fire. Not one torpedo launched did any serious damage. Japanese aircraft carrier Hiryu, photographed by a Yokosuka B4Y aircraft from the carrier Hosho shortly after sunrise on 5 June 1942. Admiral Nagumo had a problem. His planes returned from Midway and were being re-armed for the next bombing run. But he had just gotten a report that the American navy was in the area. Its exact composition was unknown. So he ordered a change in the ordnance for the attack planes. Instead of attacking land-based targets they would arm to destroy ships. The result was there was a lot of ordnance out on the deck on the carriers where this was being done. With the Japanese combat air patrol out of position having dealt with the torpedo squadrons they were not able to intercept the next wave of attack. American dive-bomber squadrons from Enterprise, Hornet, and Yorktown would seemingly arrive nearly at the same time. It was one of the greatest coincidences in military history. Three Japanese carriers–Akagi,Kaga, and Soryu–would be sunk that day. The surviving carrier Hiryu counter-attacked by sending our air squadrons to attack any American carrier they could find. They found Yorktown and dropped three bombs heavily damaging the ship but not sinking it. Admiral Fletcher moved over to cruiser Astoria while it was being repaired. A second air attack an hour later would further damage Yorktown. She would later sink when being towed on 6 June by a torpedo fired by a Japanese submarine, which also sank the destroyer Hamman. The Japanese believed they had turned the tide and would be able to go on with the Midway plan. They knew a huge fleet of destroyers and support craft was on the way. However the Hiryu was found late in the afternoon. An air attack by Enterprise and Yorktown bombers resulted in four or possibly five bombs seriously crippling her. The fires prevented any planes taking off or landing. The crew would evacuate and later Hiryu would sink. Spruance, not wanting to risk exposure to Japanese forces and wanting to protect Midway would retire to the west. Admiral Yamamoto still wanted to invade Midway and proceeded on course. Had Spruance not changed course, the remaining two carriers of the American fleet would have been exposed to Yamamoto’s destroyers. Spruance would go after the stragglers. Yamamoto ultimately ordered the fleet back to Japan not knowing the full composition of the American forces that might be pursuing. The U.S. Navy lost 1 carrier, 1 destroyer, 150 aircraft and 307 killed. Many of those killed were from the torpedo squadrons that lost 80% or more of their pilots. The Japanese lost 4 carriers, 1 heavy cruiser, 248 aircraft and 3,057 killed. It was a major victory for the U.S. but most Japanese would never learn the full details until after the war was over. The survivors of the sunken carriers and those aboard the ships that survived would be quarantined or sent on duty assignments far away from home. None of the senior officers would face any serious repercussions. Only those at the very top were informed as to what really happened. Only the Emperor and the top naval officers knew the full details. The public was told it was a great victory and the Imperial Japanese Army believed the navy was in good condition. However Admiral Yamamoto and the other senior leaders of the Japanese Navy knew the truth. The United States would soon come out stronger than it had been before the attack on Pearl Harbor. For the United States it would prove the value of intelligence gathering and code-breaking. It would continue to be an important part of the war effort and would yield even more useful information down the road with dire consequences for Admiral Yamamoto. The code breaking led directly to his plane being shot down in 1943 as payback for Pearl Harbor. (Please note this is a very condensed description of the Battle of Midway and had a lot more stages in it than reflected in this writing). 1. Lord, Walter (1967). Incredible Victory. New York: Harper and Row.